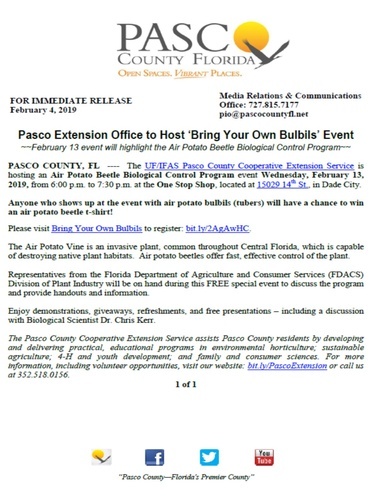 PASCO COUNTY, FL ---- The UF/IFAS Pasco County Cooperative Extension Service is hosting an Air Potato Beetle Biological Control Program event Wednesday, February 13, 2019, from 6:00 p.m. to 7:30 p.m. at the One Stop Shop, located at 15029 14th St., in Dade City. The Pasco County Cooperative Extension Service assists Pasco County residents by developing and delivering practical, educational programs in environmental horticulture; sustainable agriculture; 4‑H and youth development; and family and consumer sciences. For more information, including volunteer opportunities, visit our website: bit.ly/PascoExtension or call us at 352.518.0156.